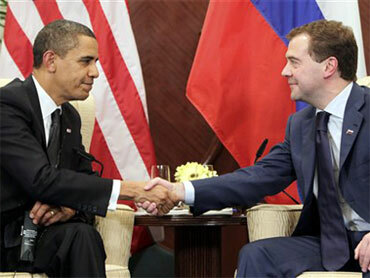 President Barack Obama on Saturday had what the White House described as an "encouraging" phone conversation with Russian President Dmitrty Medvedev as the two countries sought to work out the remaining issues on a treaty to significantly reduce nuclear arsenals. National Security Council spokesman Mike Hammer said the two presidents reviewed progress toward an arms control accord that would succeed the 1991 Strategic Arms Reduction Treaty, which expired in December. "The results of their talks are encouraging, and both leaders are committed to concluding an agreement soon," Hammer said in a statement sent to The Associated Press Saturday night. The Kremlin, in a statement cited by The New York Times, was even more positive, saying "it is now possible to talk about specific dates for the submission of the draft START treaty for signing by the heads of state." Negotiations to renew and strengthen the old START treaty have been going on for about a year. Among the sticking points have been Russian opposition to U.S. plans to locate a missile defense system in eastern Europe and questions of monitoring and verification. President Obama and Medvedev agreed last July to work out a treaty under which warheads would be capped at 1,500 to 1,675 from about 2,200 each side has now. Mr. Obama is holding an international nuclear security summit in Washington in April, giving the two sides an incentive to have a deal ready to sign by that time. The issue could come up when Secretary of State Hillary Rodham Clinton visits Moscow next week for talks on how to stimulate Mideast peace efforts.